Today the Bureau of Labor and Statistics (BLS) reported that the unemployment rate for Post-9/11 veterans* saw a slight decrease from 6.7 percent in February 2015 to 6.5 in March 2015. Among all veterans, unemployment rates decreased, from 5.3 percent in February 2015 to 4.9 in March 2015. The national employment remained unchanged at 5.5 percent in March. The BLS also recently released their annual report, the Employment Situation of Veterans 2014. Overall, the employment situation of all veterans has improved over the past few years. 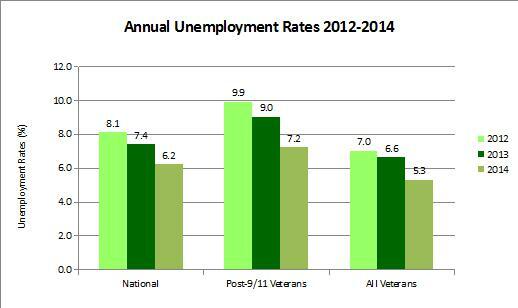 However, unemployment rates for post-9/11 veterans remained higher than those of the nation as a whole. As shown in the graph below, annual employment rates in 2014 were 7.2 percent for post-9/11 veterans, 6.2 percent nationally, and 5.3 percent for all veterans. 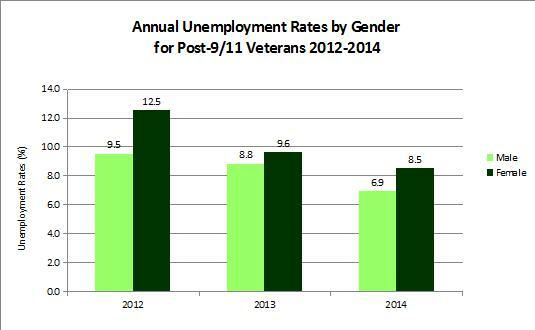 Among post-9/11 veterans, women continue to struggle with unemployment compared to their male counterparts. For male post-9/11 veterans, the unemployment rate went from 8.8 percent in 2013 to 6.9 percent in 2014. For women, the annual unemployment rate decreased from 9.6 percent to 8.5 percent. Employment initiatives will continue to be particularly important for women veterans and other minority populations, which continue to see higher unemployment in the veteran community. Post-9/11 veterans also continued to choose occupations in public service in 2014. In 2014, there were 2,535,000 post-9/11 veterans in the civilian workforce. Among those who were employed in 2014, a larger proportion of post-9/11 veterans (14%) worked for the federal government compared to employed nonveterans (2%). Veterans with a service-connected disability were also more likely to work for the federal government (21%), compared to those with no disability (6%) or nonveterans (2%). While post-9/11 veterans are still facing higher unemployment rates, annual trends show a steady improvement. Initiatives that set the stage for long-term success, leaving no veteran behind, will be the way forward for our nation. Public and private sector employers should continue to work together to reach out to the veteran community, to fully utilize the talents, skills, and experience that all of our veterans have to offer. 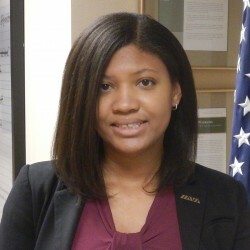 For more suggestions on how these sectors can work together to employ the newest generation of veterans, please see IAVA’s 2014 Policy Agenda.